Utpala (Fl.) (Nymphaea stellata Willd.). 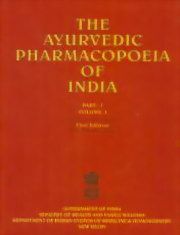 The Ayurvedic Pharmacopoeia of India is the legal document of standards for the quality of drugs, substances and preparations included therein (under the Drugs & Cosmetics Act, 1940). This 3 volume consists of 100 monographs of single drugs of plant origin. Pharmacognostical, chemical and ayurvedic standards of the parts of the plants used in Ayurveda are described in detail in each monograph.